Even if you have never dealt with a bed bug issue before, the simple thought of them can cause fear in many people. 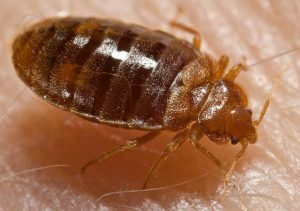 There is good reason: bed bug bites can be painful and irritating, and no one likes to think of any bugs living in their home. But just how do bed bugs find their way into the home to begin with, are they flying in from somewhere else or jumping up from the ground through our front doors and open windows? The answer is, no – bed bugs do NOT jump, or fly. They crawl – they also might “jump” from one host to another, however, not over any great expanse. If someone had bed bugs on them and rubbed against another, the second person might attract that little traveler…but if there is a greater distance between the people, there is much less of a chance of this happening. So how then, do bed bugs typically move around? They are actually quite fast, and their tiny size means they can scoot up a pant leg, down a headboard, or from a suitcase to a bed with almost no detection. They find a place to breed and nest, and can quickly become a problem if not treated. What to do if you think you might have bed bugs: If you believe you might have a bed bug issue, you will want to handle it as soon as possible and prevent it from becoming more damaging. We recommend to hire a bed bug dog team, as these incredible canines have shown a 97% success rate in finding live bed bugs. A trained handler and dog will be able to locate and identify any live bed bugs or eggs in your premises, and help you to understand you next best steps forward. Do realize, if a bed, chair or other piece of furniture is badly infested, it is not uncommon to have to destroy them to prevent additional issues. Sometimes, heat treatments and pesticides and work, but it will depend on how severe you issue is. The best plan of attack is to be earnest in detecting – and immediately handle any issue uncovered. While bed bugs are never a welcomed guest, it may help you to realize that they cannot fly into your home or office, nor are they likely to jump up to get in there. Instead, bed bugs will crawl quickly from host to host, always hungry – always a problem for anyone who has to take care of them and the damages they cause.